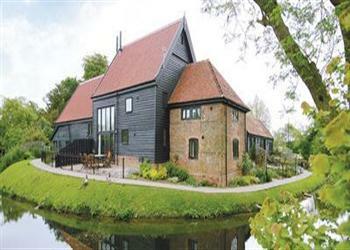 Tithe Barn, Wattisham Hall Cottages in Wattisham, Suffolk sleeps 9 people. These renovated old farm buildings exude charm, with exposed beams and oak floors, and are set in the most idyllic location amidst the owner’s 350-acre working farm. Adjoining one another, they are surrounded by a moat and rolling Suffolk countryside, and provide an ideal ‘get away from it all country holiday retreat’, yet lie within easy driving distance of numerous places of interest. Spacious open plan living/dining-room with sofa-bed (for +2), wood-burning stove, oak floor and French doors to enclosed patio and garden area. Well-equipped farmhouse-style kitchen area with traditional oak units and brick floor. Double bedroom with sloping ceiling. Single bedroom. Bathroom/W.C. with shower attachment. Shower room/W.C. First floor: Double bedroom (6ft zip & link bed) with sloping ceiling. Twin-bedded room with sloping ceiling. Beamed throughout. For a better idea of where Tithe Barn is, you can see Tithe Barn on the map below. Tithe Barn is in Suffolk; should you be on the lookout for a special offer, you can find all the special offers in Suffolk. It's always worth checking to see what is on offer at the moment. Do you want to holiday near Tithe Barn (BPU), you can see other cottages within 25 miles of Tithe Barn; have a look to find your perfect holiday location.